After going around the houses, it seems like My Hero Academia has a UK home now. 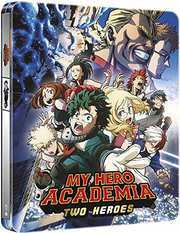 Or at the very least, one distributor will release more than one instalment of the franchise; Season 1 came to us in expensive collector’s edition form from Universal, before the second season got a regular release in two parts directly from Funimation/Sony. That little partnership isn’t quite gelling in the UK the way it has in the US, so once again Funimation are outsourcing releases. 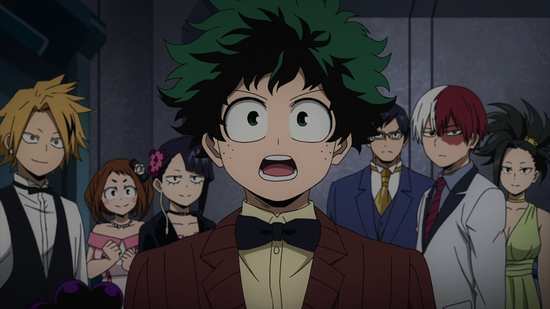 Manga Entertainment are bringing us the first My Hero Academia movie, and later this year, they’ll also release season 3. Now if only Season 1 would get a standard release. You can call them superpowers, you can call them mutations. 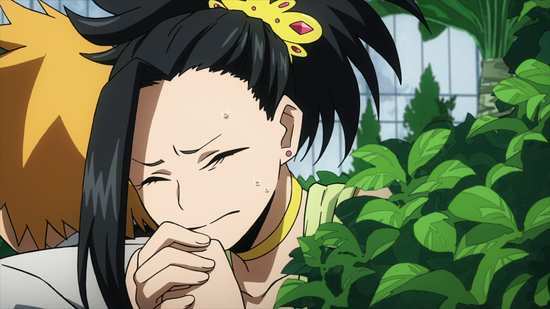 In the world of My Hero Academia, they’re mundanely thought of as Quirks. I say mundanely, as some 80% of the world’s population have Quirks, some power or ability that makes them special in some way. Naturally there are people who use their Quirks for selfish, even illegal gain. Standing against them are the heroes, those who use their powers for the common good. 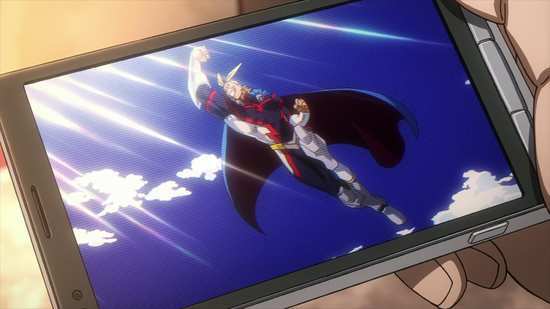 From the day Izuku Midoriya saw the world’s #1 hero, All Might in action, he was certain that he too would become a great superhero. The only problem was that Izuku was one of the 20%, born without a Quirk. 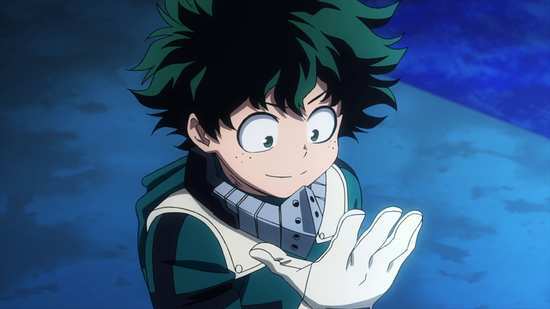 But Izuku’s selfless actions in a crisis situation caught the attention of All Might, who decided that the young boy would inherit his power. Getting used to a sudden new Quirk doesn’t happen overnight, and even with intensive training, Izuku is still playing catch-up when he enters U.A. 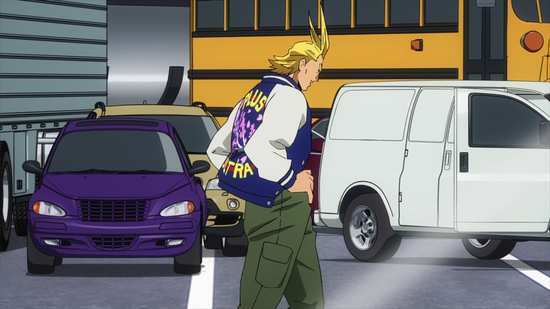 High School, where the world’s heroes are trained. As the movie begins, the U.A. Sports Festival is over, and the subsequent mayhem has been dealt with. 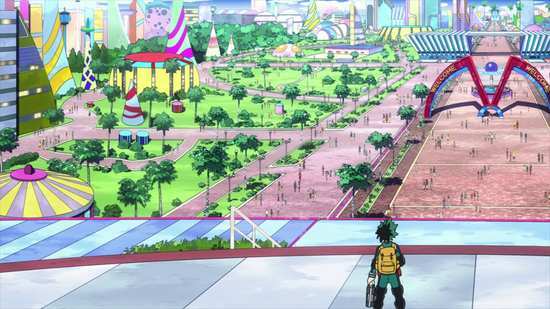 It’s a chance for a little downtime, and All Might has invited Izuku on a trip to I-Island. I-Island is the artificially created refuge for the world’s scientists researching quirks. It’s an impregnable fortress, where people can freely exercise their quirks, and which has a zero crime rate. The world’s eyes are now on I-Island as the first I-Expo is about to begin. All Might’s reasons for visiting are a little more personal, as he’s looking to visit his old friend and chief researcher Dave Shield. The eve of the I-Expo exposes the weakness in the island’s security, and villains attack, usurping the automated security systems, and taking everyone, including the island’s Heroes hostage. 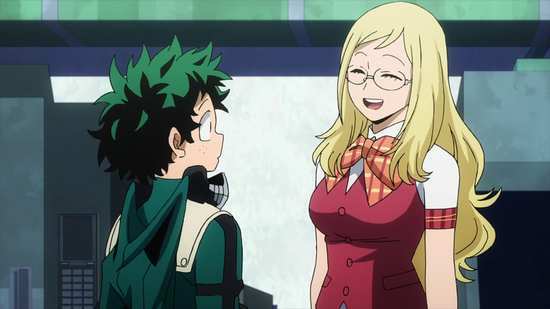 Everyone that is, except Izuku, and it turns out that he isn’t the only student from U.A. High School visiting for the Expo. My Hero Academia’s first movie gets a 1.78:1 widescreen 1080p transfer. The image is clear and sharp, the animation is smooth, and there’s no problem with visible compression, and there is only the slightest occasional hint of digital banding (I only noticed it in one scene). 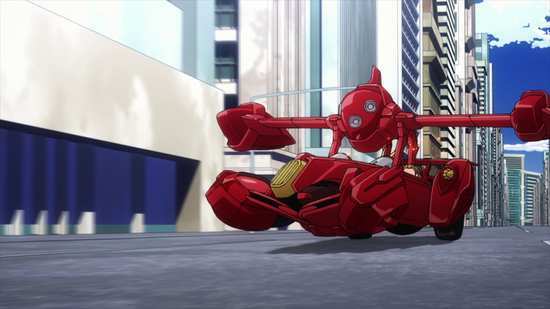 Studio Bones do the honours for the animation, and they take the simplistic character designs from the series, the style of the world design, the brilliantly brought to life action sequences, and they turn it all up to 11 for the feature film. This is a film that rewards fans of the franchise with its visuals. Manga Entertainment have authored this disc locally, and contrary to their usual efforts, they hardly put a foot wrong with this release. It all comes down to what you think of Manga’s usual thinner off-white font for their subtitles. You have the choice between the robust DTS-HD MA 5.1 Surround English and Japanese audio tracks, with optional HOH English subtitles (dubtitles), a translated English subtitle track, and a signs only track. Yes, the audio and subtitle options are unlocked during playback, and you can watch the film ‘clean’ if that’s your choice. I was happy with the Japanese audio, the music suits the superhero story well, and the action really hits the sweet spot. Manga usually have trouble with having more than one caption on screen at one time, but there is no overlapping dialogue in this film, and at only one point did a screen text translation slightly overlap with a dialogue translation, and even then, the text translation only needed another half second to feel comfortable; it was still readable without skipping back. Really there are no problems with the subtitling on this disc, and having the HOH captions for the dub alongside the translated subtitles as an option should be standard on all anime discs, not just a rarity like this one. The disc autoplays with trailers for Pokemon: The Power of Us, Dragon Ball Super Broly, and Darling in the Franxx before booting to an animated menu. The sole extra on the disc is The Making of a Hero featurette from Funimation, which lasts 18:09. A few days ago, I watched Marvel’s Doctor Strange, which was good in a ‘meh’ way. Then last night I watched this film and was left with the lingering feeling that Marvel movies should be this good. Then this morning I remembered Guardians of the Galaxy, but my point still stands. My Hero Academia: Two Heroes is a damn fine superhero movie; what The X-Men might have been like without the existential angst. Two Heroes is wonderfully entertaining, thrilling and fun, hilarious and heartfelt, doing justice to the characters and delivering a fine story. It’s not an original story, but if you’re going to crib, crib from the best. Two Heroes is another take on Die Hard, with terrorists taking control of an island (and more importantly a 200 storey skyscraper), taking everyone hostage, except the untested, student heroes, With almost everyone having superpowers in this world, the challenges are extreme, and the solutions are fantastic, which makes for a great visual spectacle; and of course no one in this story universe is so super strong as to be invulnerable. The possibility of losing is always there, making this a more exciting story. Case in point, All Might is one of the hostages, unable to act, leaving it to his student Izuku to lead the resistance. 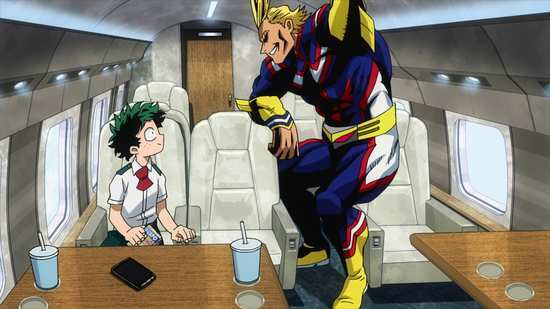 It looks at first to be an isolated, side story to the franchise, beginning with a flashback to All Might’s past, before leading to the present day with just All Might and Izuku on a plane to I-Island. 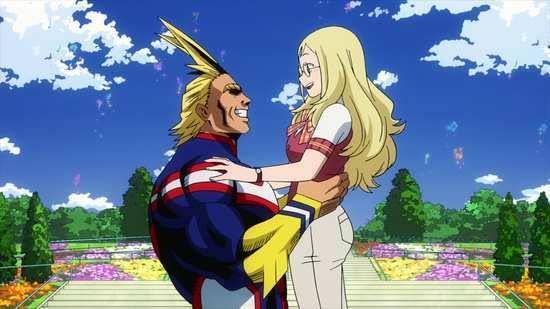 They meet All Might’s friend Dave Shield, and Izuku also meets Dave’s daughter Melissa, a trainee researcher, who turns out to be the guest character that usually drives the plot of these non-canon feature film spin-offs. Speaking of feature film adaptations of long running shonen shows, they usually wind up being filler with high production values, never advancing the plot or developing existing characters. Two Heroes seems as if it bucks that trend, as it actually offers Izuku a new perspective. He grew up a quirkless boy who wanted to be a hero, and thought that without a quirk he’d fail. He eventually got his wish. 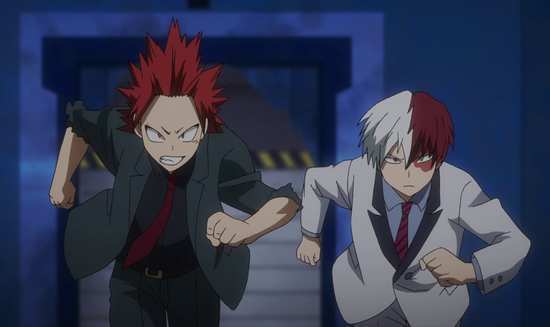 Two Heroes actually shows him that someone without a quirk, without any powers, can still be heroic. I doubt it will stick for season 3, but it certainly gives the story heart. The side-story aspect fades as soon as we learn that the other students from the school are also on the island for the Expo, either on vacation, visiting on behalf of their rich parents, or working summer jobs. It isn’t long before the usual antics and byplay resume, contributing much to the humour of the film. And naturally, the friends all work together in their ‘quirky’ ways to fight the terrorists. The film unfolds with pace and tension, inexorably pulling you towards the edge of your seat, and it even delivers a couple of entertaining twists. 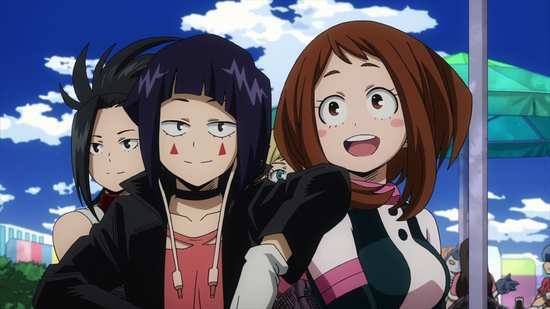 The only complaint I have about this film is that there’s not enough Froppy. There are superhero movies galore out there. There are more than a few Die Hard clones out there as well. But by combining the two, Two Heroes feels fresh and original. This might be a direction in comic book movies worth looking at, combining unexpected genres and seeing what results. 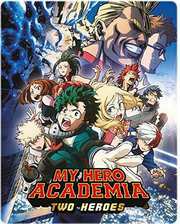 Manga gives the film solid presentation and it’s well worth picking up to add to your My Hero Academia collection.